THE NATURAL HAVEN: What made the biggest difference to your hair? What made the biggest difference to your hair? Are you on a seemingly endless quest for a perfect product? Well here is one post which will not indulge you! (lol). I want to talk technique, technique, technique. 1. Manage your hair better. 2. Retain hair growth better. 3. Happier with your self image. 1. Pre-wash oiling of hair, washing hair in sections, finger combing, conditioner combing,silk scarf at night. 2. Finger combing, Never using extensions, Trimming, Laziness (super long protective styling 7-8 weeks). 3. Smiling at my reflection in the mirror. So there you have it and now I want your list! The rules - no product mentions! 1. Washing hair in sections, washing twice a week, combing from ends to roots only when conditioner is hair, satin bonnet at night. 2. No dry combing ever, stopped using extensions (currently fighting the itch), stopped flat ironing, no need for trimming due to better maintenance, and wearing my coily fro just the way it is. 3. Smiling with pride whether I get compliments or blank stares, because I never realized how beautiful I am until I stopped conforming. 2) Banding hair (not tightly) in 10 sections with cut up trouser socks (5 on each side), letting it air dry and then pinning the banded hair up in a style and leaving it be until next wash session....this is the absolute BEST thing I've ever discovered for my hair. 1. Wide-tooth [conditioner] combing, deep conditioning. 2. Protective styling, finger combing, keeping ends adequately moisturized. 3. Becoming aware of my amazing identity/inheritance in Christ... I can, because He is. 3. Alternating between moisturizing and protein conditioners. 1. Washing & detanging hair in sections. Helped to reduce a ton of shedding...and most importantly aggravation! 2. Sealing & trimming my ends. Holding onto damaged ends is never worth it, and is a real hindrance to hair growth & sealing hair often just helps prolong whatever style I'm wearing. 3. Finally embracing being 'The Girl with the Hair'...either at work or at a social event. Used to hate it, now I smile and say thank you when receiving compliments. I loved reading all your responses!! 1. Steaming/deep conditioning every week, without fail. 2. I finally gave up blow drying (4 months and counting)! Technique is so underrated; great post! 2. Protective styling (in twists), dusting when needed, prepoo-ing with coconut oil, wearing silk scarf to bed, moisturizing weekly, detangling 1x a month and not more frequently than that. 1. A wide-tooth come and lots of slippery conditioner. Also,do not wash and go under any circumstances. 2. Protective styles such as twists are best for my hair. 3. Even when my hair isn't done I tell myself I am beautiful. 1. Pre-pooing w/ oil, detangling before washing, washing hair in twists. 3. Knowing that I do not rely on someone else to "care" for my hair, but that I can CARE for it myself. Pre-wash oiling of hair. 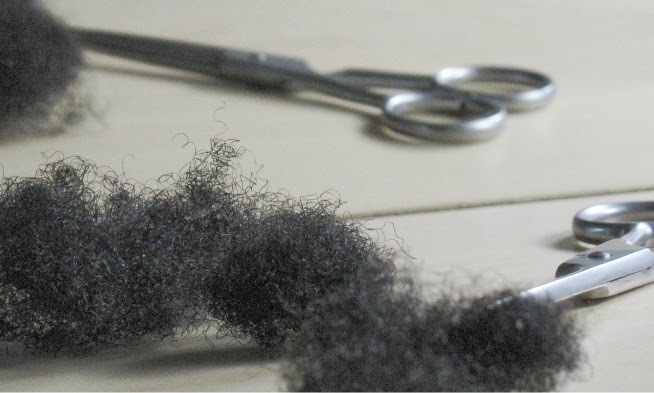 Regular removal of shed hair by finger-combing. Washing once per week, maybe just co-wash. Moisturizing and sealing mid-week. Twists 99.5% of the time, pinned into updo with hair pin. Scarf to bed every night. No combing, no elastics, no sulfates, no exposure to extreme weather, no hair ends touching my shoulders. 1. Oil: before, during, and after washing hair (big twists). 2. Finger combing. Leaving hair in twists, braids, and buns for weeks. 3. Staying relaxed. Not worrying about the fuzz anymore. It's not going to kill anyone. 3. Going natural. As stereotypical as it sounds, I did a lot of soul searching after I went natural and I learned a lot about myself and the world. NOTE: I have come to the main realization as I've surprisingly came across this post is: NO PRODUCT is the magic potion to managing natural hair. It's all about technique. Whatever product(s) you choose to use just supplements your vital techniques on natural hair. 3.Accepting the frizz, using hair accessories. Feeling empowered because I almost never need to visit a salon and loving the unique gift that is my crown! Not forgetting to smile at myself in the mirror even on a ''bad'' hair day! 3. Figuring out that my hair is very fine and working with what I've got. how come you ALWAYS know the drama that is going on in the natural hair online community? lol lady jaye, I spend an inordinate amount of time online. I actually found the last bit of drama by visiting the normal youtube channels I always visit. 3. I was already doing most of the other things people are mentioning like washing in sections, finger-detangling, silk pillowcases, etc. I started my healthy hair journey after a cut from WL to APL after growing out heat damage. 2. protective styling; treating my hair very delicately, doing everything in sections, detangling on damp hair prior to washing, and letting go of trying to detangle while in the shower. 3. coming to the realization that 99% of the people who are most likely to have a problem with my hair, are people who's opinion, at the end of the day, I care the least about - i.e. people that I don't even know!!! You are all great! I will compile this up into a list!! 2. All of the above plus low manipulative styles, air drying, and no heat. 3. Feeling my new curls come in and knowing that I won't "fry" them again. I forgot washing in sections! It is 2nd nature to me now, I'd be shocked to see it done any other way. 3. Realizing that the hair that grows out of my head is so beautiful that I don't "have" to do anything to "fix" it. There's no better way to improve your self-image. Makes me walk straighter every day :) Wish I would've come to this realization YEARS ago! 1. Pre-pooing with oil + conditioner (or is this deep conditioning? Whatever). Co-washing hair in sections whenever my hair starts to get grimy (which isn't very often, actually). Detangling once a week with a wide tooth comb + a detangling paddle brush so there isn't so much shed hair causing knotty knots. MOISTURIZING + SEALING. 2. Never letting my hair get super shrunken up. No relaxers. Keeping hair stretched through twisting or braiding. Pinning up fat twists into cute little updos. I find if I do too many twists, it's too much manipulation. Usually six or eight is enough to last a week in a pinned up style. 3. Watching YouTube videos and seeing other naturals like me looking all cute and happy. 3. Working with what I got. 1. The understanding that products and tools are secondary to technique has greatly changed the way that I handle my hair. I find it best to deal with my hair in sections at all times, from detangling to washing and conditioning in braids or twist, to air-drying and styling. 2. Banning all combs and brushes! I now only finger comb. I have seen some retention since I started protective styling, but I think low manipulation has been key in my length retention. 1. Never ever under any circumstances blow-dry. The less damage to my hair, the easier it became to manage. Being super gentle and patient. 2. No blow dry, no flat iron. A good quality paddle brush and two seam free wide tooth combs. I still have knots and split-ends, but thankfully no problems with hair breakage anymore. You mean, besides going natural, Jc? I still wish for big hair but oh well, a girl can't have everything, right? 1. In general the less "management" I do, the better. My hair is short now, but when it was longer I tried to be extremely gentle when washing, detangling, and styling. 2. See #1. I have also come to terms with the fact that if I ever want to have truly "long" hair, I'll probably have to loc it because, again, for me personally, too much manipulation leads to breakage. 3. Once I figured out all the lies behind the lye, so to speak, I resolved to no longer be played by the black hair "care" industry or any other beauty industry. I also resolved not to internalize any criticisms of my hair or anything else of me that's obviously West African in origin ESPECIALLY when the criticism was coming from black people. I refuse to go through my life believing that I am ugly by default. Other black folks might believe that (they don't say it, but they certainly SHOW it), but I don't, and I won't. What ????? 7 to 8 weeks protective style? Now i need to know witch PS that is. The braids ? The big ones ( one inch at the root) or the tiny ones ? Don't you have a hard time unravelling them after ? What is you secret? How long does it take you to unravel ? Pleaaaaase. 1&2- I slightly finger comb the hair before putting it in 4 or 6 braids. After i wash, i unravel one braid , towel blot and old t-shirt blot, condition (shea butter and castor oil)and twist. after all the braids are twisted. I quickly unravel and quickly pull the hair into a ponytail with a satin scrunchy,. Then i do a single braid with the remaining hair and bun the braid. My twist bang i braided to the side till it dries. At night, I remove the scrunchy from the root and put it back in the morning. This style is good for a whole week. My twist bang is only redone every 3 weeks. This is my best low manipulation, no time consuming protective style. My hair is a 4C type. 3-Being more aware of my inner value helps me stop trying to prove my value by over altering my physical appearance. When I do not put that burden on my physical appearance. I fully appreciate its beauty. Kadiane - Oh I never do small braids. I have stuck with my big ones (inch or so at the root). I have a very very high tolerance for fuzziness. At 7 weeks my hair does show signs of locking, which prompts me to take out the braids. I still wash and condition my hair as normal (i.e once or twice a week depending on swimming). I have found that it is very easy to keep my braids in when I am busy. I just cannot be bothered to take them out, until they have to be taken out. Jc, I wish I had your tolerance for fuzziness. I usually get annoyed after 2 or 3 days! So now I don't even bother with protective styles that are intended to last a long time. Just fat twists, which are pretty low manipulation to put in, that last a week or so. Maybe I'm too scarred by the culture of grease and hard brushes and gel and so on. Fuzziness was the devil when I was a kid. 1. Washing once a week so my ends don't have the opportunity to get crazy. Detangling with a Denman brush. Protective styling/keeping ends tucked away. 2. I really think #1 applies here as well. 3. Taking pride in how I present myself. Having fun with my accessories. 5. Rock twist-outs mainly in the Spring/Summer months.